Anyone want a $2 million Vancouver Island waterfront home? The Vancouver General Hospital and University of B.C. Hospital Foundation is offering something special in its annual Millionaire Lottery: an oceanfront showhome at Sooke Point. The lottery has raised more than $50 million for the hospital foundation, G.F. Strong Rehabilitation Centre, Vancouver Community Health Services and the Vancouver Coastal Health Research Institute so far, and this year’s lottery includes 3,000 prizes worth more than $4.3 million, including luxury homes, vacations, and cars. The grand prize Sooke Point cottage, with 1,770 square feet of living space, is valued at $2.2 million. Proceeds from this year’s lottery will buy ceiling lifts, scopes, ventilators, research programs, basic supplies, and a special piece of portable equipment that will allow surgeons to give CT scans on patients during surgery. “I think what’s so special about the lottery is that it gives people a unique opportunity to win something awesome for themselves, while also knowing they are making a difference for hospitals that serve the entire province,” said Angela Chapman, senior vice-president of philanthropy at the hospital foundation. Every year, the foundation chooses a vacation home for one of the grand prizes. The winner can pick from seven “dream homes,” with Sooke Point as one of the offerings. Other homes are located in South Surrey, Richmond, Vancouver, Squamish and Kelowna. The Sooke Point cottage is located three minutes from Iron Mine Bay, and five minutes the other way from Emerald Beach. There is also beachfront hiking trail that takes approximately six hours to hike one way. “You’re half an hour away from Costco, under an hour away from the airport, but it feels like you’re light years away from civilization,” said Michael Thornton, developer of SookePoint Ocean Homes. The cottages are built five metres from the ocean, giving you a front row seat to what nature has to offer. The wall facing the water in the home is made entirely of glass sliding doors that open up to a private deck. “The view from your living room is straight out of National Geographic,” laughed Thornton. “Every day is something different, you will see whales, sea lions, eagles, all sorts of wildlife, along with the Olympic Mountains and will also be able to see lots of fisherman and boats out on the water. “Having this kind of this kind of relationship with the sea and the sea life, to me is the most special thing about these cottages,” he added. 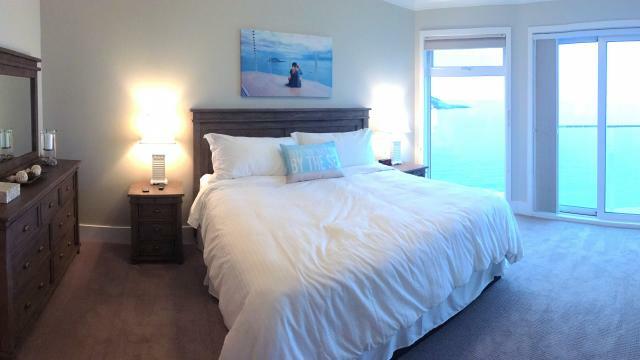 The Sooke home also comes fully equipped with furniture, household goods, appliances, and televisions in every bedroom. “We call it a ‘toothbrush home’ because that’s all you’ll need to bring when you move in,” Thornton said. Tickets for the lottery are $100 each, two for $200, three for $250 and eight for $500. This year’s lottery has an additional early bird draw, with two chances to win a total of $250,000. The deadline to buy early bird tickets is Dec. 8. For an additional $15, players can also play the 50/50 Plus and win half of a $2.2 million jackpot, and for $20 more, you can play the Daily Cash Plus, with 63 winners daily and $236,000 available to win. Tickets must be bought by Jan. 12. You can purchase tickets online at www.millionairelottery.com, by phone at 604-602-5848 or 1-888-445-5825, or in-person at London Drugs.